If you asked me to give you a list of my favorite roots vocalists, Dennis Brown would most likely be the 2nd or 3rd name to come out of mouth. You could throw people like Cornell Campbell, Sugar Minott, Bunny Wailer, Burning Spear, Peter Tosh, Gregory Isaacs whatever, since I started listening to reggae outside of Bob Marley (I still don't listen to a whole lot), Dennis Brown has always been one I just love to latch onto. Deep Down isn't necessarily a special album. For my money, I can't find a review of it on the net, but I can find some ratings here and there. It's not critically praised or anything, and it in fact ISN'T the best Dennis Brown release there is, but I still love his voice. This is good roots from '74 and worth listening to. 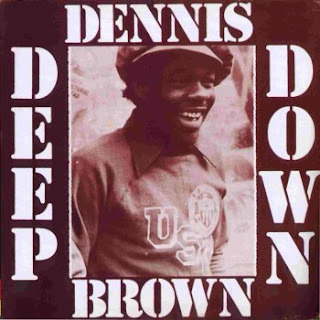 Summer is approaching, and there's not much better music to bring the season in than that of Dennis Brown. Roots Archive Info on "Deep Down"